One of my favorite books featuring toy photography is Hitler Moves East: A Graphic Chronicle, 1941-43 by David Levinthal and Garry Trudeau (yes, that Garry Trudeau). With a cheap toy challenge going on in our MeWe community plus an In the Style of Challenge presented by James and Kristina on the podcast, I thought I might attempt creating images in Mr. Levinthal’s style. Hitler Moves East is a collaboration born out of two students final thesis’s at Yale School of Art. 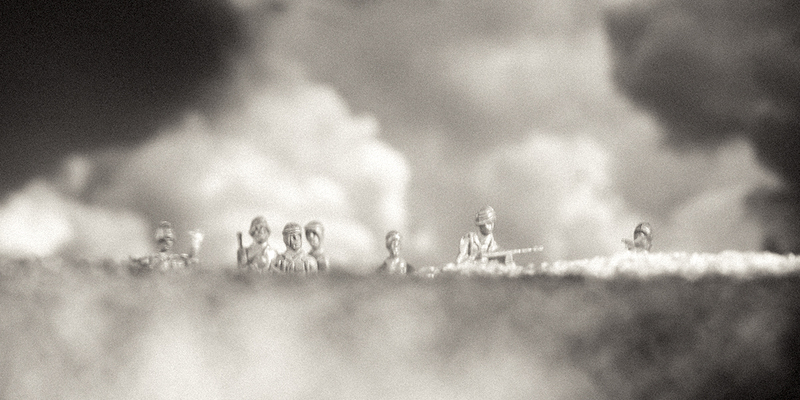 Levinthal was working on a series of high contrast photos of German war toys on a white seamless backdrop. At the same time Trudeau was working on a written narrative about a fictional Luftwaffe flight lieutenant. Trudeau was impressed by the “special sort of truth born of contrast – a visual history told in terms of non-ordinary contradictions.” They combined their efforts and created something entirely new to both artists: Hitler Moves East. I too am impressed by the powerful story that emerges through these images. The horror, loneliness and destruction wrought by the war machine are clearly visible in these images. They have been haunting my minds eye for several years now. David Levinthal is a master of the toy photography genre. His art work transcends toys and his final works act as a mirror to our culture. You can see the influences of this artist in the work of many toy photographers who have come since. I highly recommend checking out his Bad Barbie series as well as the full images from Hitler Moves East. As with all great ideas it seams my memory is faulty. Before I reexamined the book Hitler Moves East to get ideas for images to reproduce I dropped by my nearby thrift store and picked up some inexpensive plastic toy soldiers. I had an idea for an image that I thought was in the book. 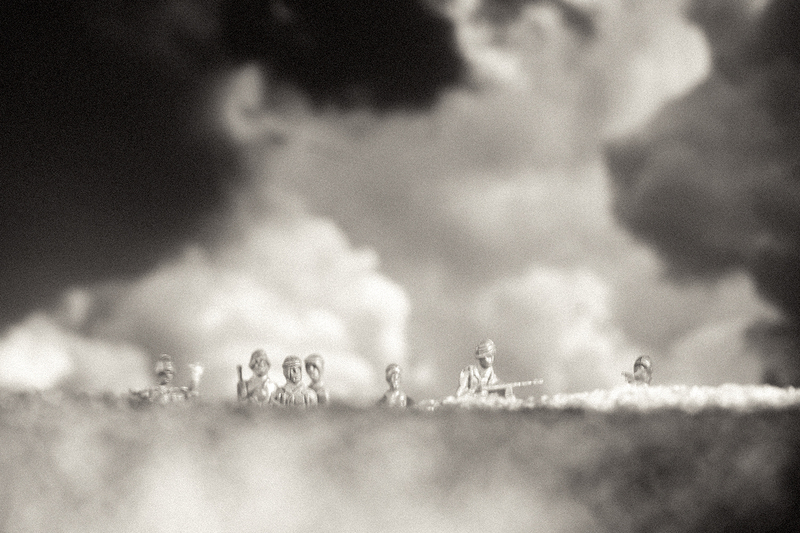 Something about soldiers, barbed wire and smoke. When I looked at the book searching for this particular image I realized two things 1) that image was not in the book (Maybe I got confused with images by Robert Capa?) and 2) the toys that Levinthal used were not cheap plastic war toys, but high quality German miniature toy soldiers, tanks, trains, buildings and planes. Nothing like the cheap toys I had picked up. I wasn’t going to let my faulty memory stop me! Why not try to recreate his images with LEGO? I love the cover image of the german soldiers riding straight towards the viewer in a vintage motorcycle complete with side car. Their must be some equivalent LEGO pieces. In fact I know I have a LEGO side car from the early Indian Jones sets. While I dont have any minfigures circa World war II, I thought I could substitute Indiana Jones and his father. Well as the story goes….the best laid planes always go sideway. I searched high and low for my beloved side car with no success. Like a German soldier on the Russian front…I persevered. I’m unable to find a suitable substitution in my existing LEGO collection. Thats three strikes and time to move on. I decided to use the toys I had. It’s interesting to try to reproduce the analog effects of film and paper with digital ones and zeros. Sure you can quickly change your color image to black and white, add a sepia toned filter and push the contrast, but is that enough? I added grain as another nod to the original film process. But there is something raw in Levinthal’s work that I was unable to capture. Besides the obviously different toys, I was unable to capture the blur, rich tonality or depth of field that are in the original images. While I was unable to match the master I learned so much from this process. I learned to really look at what was taking place in the original images: composition, contrast, depth of field, blur, focus points, etc. While the original images are often minimalist in nature, I found them to be rich in emotion. Even after the mixed results of this challenge, Hitler Moves East is still a treasured book in my collection. One I will continue to draw inspiration from. If you’re interested in this process I would recommend taking the #TP_Recreation challenge. Choose an image, a photographer or a style that you want to emulate, take a close look…closer than you ever have before…and try to copy the image. Hopefully you will have better success than I did! 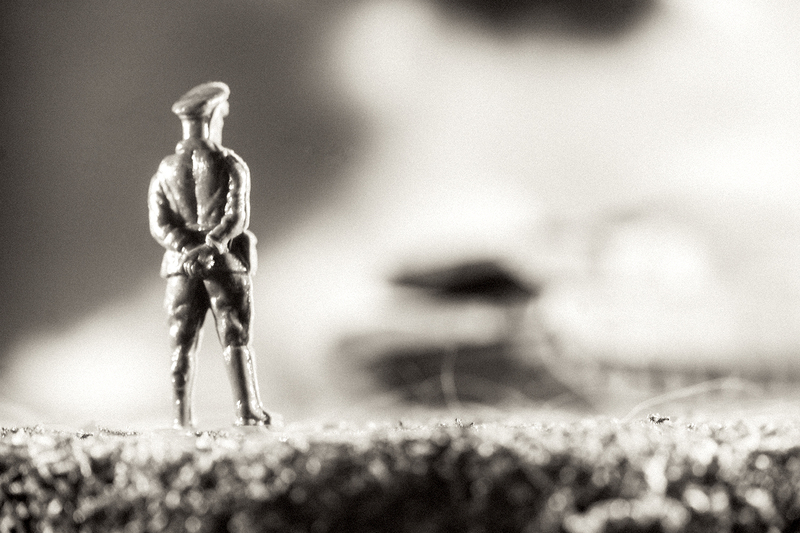 And if you’re intrigued by miniature toy war photography like me, I would recommend checking out the work of Little Solider Stories. Pierre-Jaques and Jules Ober will be releasing their book The Good Son in the US, May 2019. While Hitler Moves East is based on the German / Russian front during WWII, The Good Son takes place during WWI. It’s a touching story told through the beautiful images of Jules Ober. Great looking sets of photos, Shelly! This is toy photography ART. I struggle to find a visual description couple of weeks back about what it means to be an toy photography ARTIST instead of just being a toy photographer and these kind of photos sums it up. Also, thanks for introducing David’s work in this blog! Is a refreshing change from what I see daily on my social media feed and definitely something worth aspiring to. Yes…I am really fascinated to explore more and try to be a little more “artsy.” In fact, after your blog, I went exploring for ideas and inspiration in the work of art. Surrealism and Keith Haring pop up in my wandering round the net . Will have to get some new toys to make these ideas a reality! You might have a tendency to be too hard on yourself ! While not matching the originals, it is not a bad effort. It is a nice homage and recreation. The overall feeling is respected. By experience, I would say that the quality of the figurines makes all the difference. More than the technical aspect of photography. The choice of focus, depth of field, grading has for sure an “emotional impact” on an image. But it is nothing without the most important, the emotion drawn from the subject in the image, the figurine. Sometimes, just a tilt of the head is enough to create this. Postures and angles are useful. By the way, this is why I always thought that creating “emotional images” out of Lego is the most challenging of all in toy photography. And dear Shelley, thank you for your kind words about our book. I will ask Candlewick to send you a copy. Pierre-Jaques – you are so right! Once I really looked at his images, not in the lazy way I had glanced at them earlier, I saw he was using high quality miniatures. The detail was amazing and he used more than just figures: planes, trains, buildings etc. While I might have been in the ball park, I learned so much by taking the time to look at these images. While I was looking I really couldn’t help but think about your photographs. There are more similarities between you two as artists than with myself. 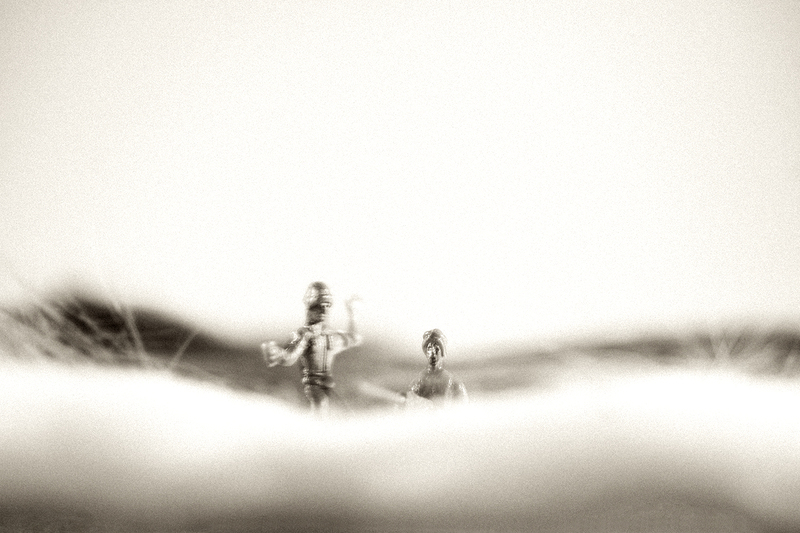 Thanks for introducing David Levinthal’s work – they are truly unique and very immersive. Though you didn’t have the same figures he used nor the analog camera he shot with, I feel that the immersive environment has been created with your 3 images. There are also similarities in the use of highlights. It is a wonderful recreation. I do suppose as well that something less tangible that might be missing is the “feeling” he might have carried when shooting those images. It reminds me of Kristina’s comment in last month’s TP Podcast about how she do not usually go back to reshoot an image as it would have lacked that “feeling” or “situation/circumstance” she was in that inspired the shoot. Stunning work Shelly. It captured my eye right away. I loved that my mind was like, “Shelly’s work? Shelly’s work!” I loved reading this post and went out and got the book. Wow. I’m so new to photography that it is great to learn backwards. Thanks for the post, recommendation, and sharing your journey and haunting pics. We just got the Boy some cheap plastic soldiers etc., for his “half birthday.” Perhaps I’ll play around with them, too.